As a social moderate and fiscal conservative, Republicans believe Jinyoung Lee Englund can keep the 45th District Senate seat in GOP hands. That likely would maintain a check on Democrats who hold the state House and governor’s office. Englund, a 33-year-old who believes in human-caused climate change and supports closing some business-tax exemptions and enacting certain gun-safety regulations, didn’t hesitate. As she campaigns for the 45th District Senate seat, Englund presents herself as a moderate in tune with this Eastside district while tagging her opponent with holding “extreme” Seattle values. Englund rails against Seattle’s recently approved high-earners income taxand raises the specter of a government-sanctioned drug-injection site coming to the Eastside. 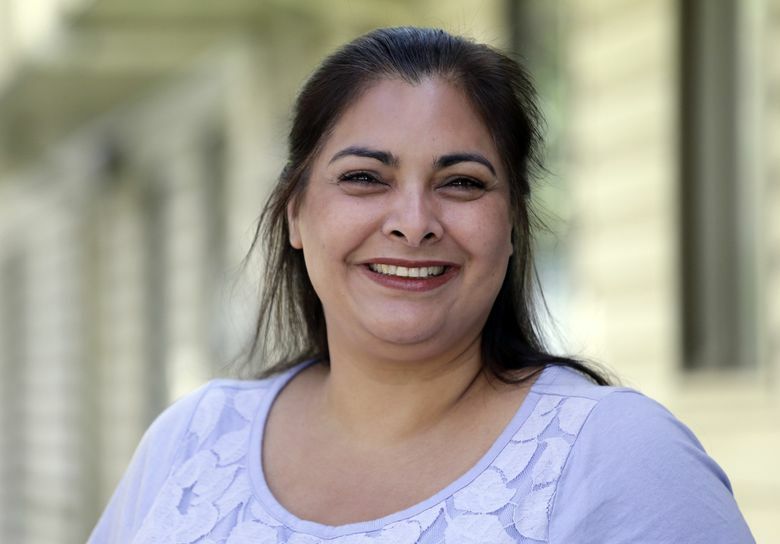 Republicans are hoping Englund’s blend of social moderation and fiscal conservatism will defeat Democratic candidate Manka Dhingra. A victory by Englund would likely keep the state Senate in Republican hands, denying Democrats unified power in Olympia. Englund has been a nonprofit worker in Africa, an advocate for Bitcoin and a staff aide to U.S. Rep. Cathy McMorris Rodgers, R-Spokane, and Republican political veteran Dino Rossi. Recently, she lived in Japan with her husband, a U.S. Marine deployed there. She returned to Washington state this March to be closer to her family, she said, settling into a Woodinville home owned by her brother-in-law. In early April, Englund said, Rossi called to recruit her for the race. Rossi — who has temporarily filled the 45th District seat after the death of Republican Sen. Andy Hill a year ago — said he’s kept Englund in mind as a potential candidate since 2010, when she worked on his unsuccessful U.S. Senate campaign. To Democrats, Englund looks like a carpetbagger with no roots in the district. With such high stakes, the residents of the district — which includes Woodinville, Sammamish and Duvall, and parts of Redmond and Kirkland — have seen an avalanche of ads and campaign mailers. As of Friday, the two candidates and independent political committees had raised or spent more than $6.6 million. Democrats and independent spending groups have used Englund’s stint with McMorris Rodgers to try and tie her to national politics and Republican President Donald Trump. Because her husband is a Marine, and Trump is his commander-in-chief, Englund said she does not criticize the president. But she has said Republicans aren’t all the same, and that she did not vote for Trump. 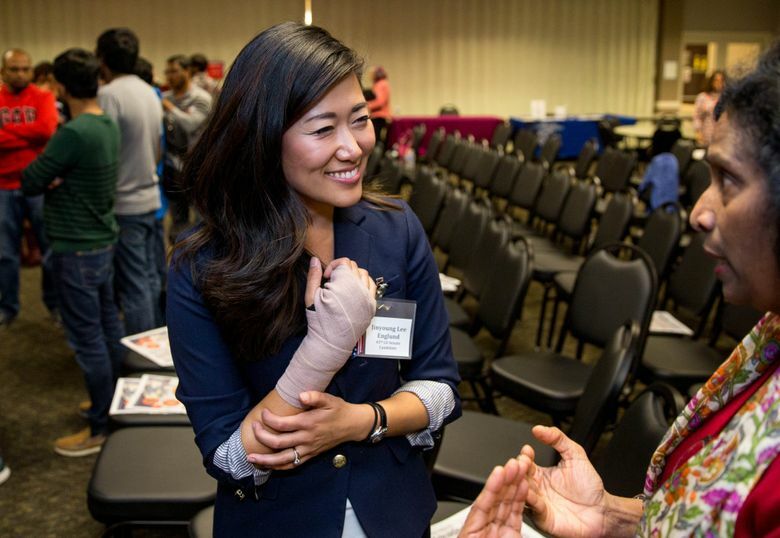 Born in South Korea, where her father was stationed in the military, Englund was raised largely in University Place, near Tacoma, and attended the University of Washington. She graduated in 2006. In an interview, Englund recounts assuming she’d go on to get a graduate degree in business. But a mentor prodded her to do something different, and she had just met someone who had worked for the missionary NGO Iris Global. With the organization, she spent about nine months in the southeast-African nation of Mozambique. It was there where Englund says she first started thinking seriously about government and how it worked. The experience, which included helping launch a water-well construction project for the nonprofit, opened her eyes to lawlessness, corruption and how government can empower people, Englund said. Volunteers and staff in Mozambiqueoften found themselves in a hot climate, without running water and little electricity, said Heidi Baker, co-founder and CEO of Iris Global. One time, when Englund and others were traveling on a water-well project, villagers armed with assault rifles detained her and her colleagues. The gunmen were seeking cameras and passports, Englund said. Baker, who was on the trip, helped negotiate their release. When her time in Africa ended, “I came back wanting to better understand America, and how the American government worked,” Englund said. She leaned toward fiscal conservatism, so she asked a friend about the Republican Party. That led her to work in 2008 on a Republican get-out-the-vote campaign in Washington state. After that, Englund was referred to McMorris Rodgers, the congresswoman from Spokane. Englund decamped for Washington, D.C., working for McMorris Rodgers from 2009 to 2011 as a scheduler and executive assistant. Englund took leave to work on Rossi’s 2010 U.S. Senate campaign. She later served as an operations assistant to Elaine Chao — now the U.S. Secretary of Transportation — while Chao was with the Heritage Foundation, a conservative think tank in Washington, D.C.
From there, Englund moved into the emerging realm of the cryptocurrency known as Bitcoin. Between 2013 and 2015, she worked in a variety of positions involved in the digital currency, including as communications director for the Bitcoin Foundation, an early advocacy group. Then she moved to Japan to be with her husband, where she worked with a group that designed an app for Marines. Called Liberty Okinawa, the app gives information about things to do in Okinawa, as well as rules and guidelines for taking leave off the base. Englund’s policy platform is built around three key issues: transportation, education and taxes. She criticizes the increased taxes voters approved for Sound Transit 3, and wants to see reduced car tab fees. She currently doesn’t have a preference between GOP and Democratic proposals to do that, she added. To reduce congestion on Interstate 405, Englund said she would convert one of the two HOV toll lanes into a free, general-purpose lane. On public education and taxes, she has taken up the GOP mantle, calling for boosting K-12 spending by prioritizing existing tax revenue. If more money is needed, Englund said she’s open to ending some business-tax exemptions. But Englund said she would have voted against this year’s state property-tax plan, which boosts education spending to comply with the state Supreme Court order to fully fund Washington’s K-12 schools. Lawmakers for years have pumped billions of new dollars into education to address the court’s McCleary decision, including the massive school-funding plan the Legislature approved in June. If lawmakers decide to roll back that plan — which hikes property taxes in at least some parts of the 45th District — Englund said Democrats and Republicans first need to agree on how to replace the lost revenue. When asked at the recent debate what funding she would have approved instead of the property-tax plan, Englund deflected.